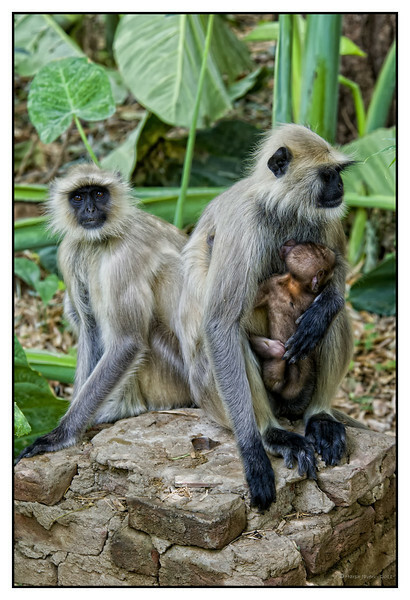 Khem Vilas, Ranthambhore Gray langurs are large and fairly terrestrial, inhabiting forest, open lightly wooded habitats, and urban areas on the Indian subcontinent. Langurs mostly walk quadrupedally and spend half their time on and the ground and the other half in the trees. They will also make bipedal hops, climbing and descending supports with the body upright, and leaps. Langurs can leap 3.7-4.6 m (12.0-15.0 ft) horizontally and 10.7-12.2 m (35-40 ft) in descending. http://en.wikipedia.org/wiki/Gray_langur Khem Vilas: At Ranthambhore, we stayed at Khem Vilas, a beautiful jungle camp with three types of accommodations nestled in open grasslands with small water bodies, spread over an area of 10 acres. Thank you Harsh for so many wonderful comments. Oh my! This is fantastic. So very fascinating, beautifully captured! Awesome capture. Nice commentary ! Fascinating shot -- wonderful information to go along with it!